So What Is A Give Camp Anyway? The Lansing Give Camp April 24-26 helped over a dozen charities. After months of preparation and a weekend with almost no sleep, Jeff & Carla McWherter and Jay & Amy Harris still had enough energy to talk about what made this event so successful. I expected that the Kalamazoo X conference would be a success but I was surprised by how successful it was. Everything started with Michael Eaton. He turned the concept - a conference consisting primarily of talks on soft skills - into reality. Assisted by a staff of volunteers, Michael secured the venue, promoted the event, signed up the sponsors and recruited the speakers. The speaker list was impressive - most traveled from Ohio and most have a solid reputation in the development community. I was grateful that Mike asked me to speak at this conference and I was excited to do it. A couple weeks ago, Mike suggested that we switch from a multi-track to a single-track event. This meant that all sessions would be held in the same room and that no two speakers would talk at the same time. In order to accommodate this format, all sessions had to be cut from one hour to 25 minutes. This was difficult for those who had already prepared an hour-long talk. However, nearly all were able to make the adjustment. (At least one speaker decided to back out after the format change was announced). For me, this was less of an issue because I had never given my talk before and had barely begun preparing it. The format worked really well. 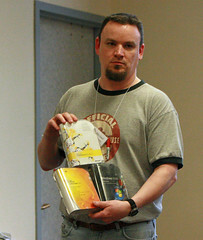 Speakers were forced to cut the fat from their slides and each talk was concise and to the point. This also gave me the opportunity to watch every session, since I never had to choose between two excellent speakers. One thing that added to the event was Mike's skills as a Master of Ceremonies. He introduced each speaker by telling a personal story about him or her. It was clear he was familiar with all the speakers and had put some preparation into these introductions. My talk - Effective Communication with your Customer or Manager - was very well received. Several people approached me afterward and told me how much they enjoyed it. I'm working on a series of articles on this topic and hope to have them out in the next few weeks. The most telling thing about the success of the conference was that there were attendance was higher at the end of the day than at the beginning. Whatever small attrition occurred during the day was more than offset by others showing up. Halfway through the first West Michigan .Net University, Chris Woodruff and Bill Miller sat down with me to discuss why they organized it and how it was going so far. Microsoft Visual Studio Team System 2010 is currently in CTP3. In this interview, Microsoft Technology Specialist Randy Pagels describes the new features of the upcoming release of this product. A Give Camp is a way to contribute your time and skills to area charities. A Give Camp is an event to meet with and hang out with technical people. A Give Camp is a way to learn new technologies by working on a live project for a few days. Charities often need software custom software, but don't have the money to hire someone to write that software. One option they have is to submit their projects to a Give Camp. The Give Camp organizers select projects that are well-defined and can be completed in a weekend. Then, they invite software developers and other IT folks from the community to work on these projects. They provide these folks a place to work and sleep and interact for a few days. Give Camps typically kick off Friday evening and wrap up Sunday evening with completed projects delivered to charities. The Lansing Give Camp takes place this weekend (April 24-26) at the Impression 5 Science Center in downtown Lansing, MI. The organizers have selected projects from ten local charities, including The Ronald McDonald House of Mid-Michigan and The Boys & Girls Club of Lansing. If you have skills in software development, design, databases, IT or project management, I encourage you to volunteer for this event. Even if you don't have these skills, you can help with the event itself. I'm brining my 14-year-old son to the Lansing Give Camp, where he will assist with setting up, cleaning up and anything else they need. Because I'm speaking at the Kalamazoo X conference Saturday, I can only attend the Lansing Give Camp Friday and Sunday, but I'm very much looking forward to it. 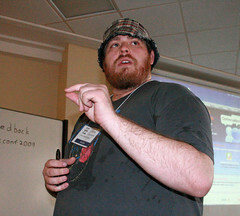 The 2009 Central Ohio Day of .Net is now history. I'm happy with the feedback I received on my Velocity talk. The room was overflowing and several people approached me afterward to tell me they liked it. By far, the best part of this conference was the opportunity to share ideas and interact one-on-one with bright people in the developer community. One of the best jobs I ever had was working with the great people at GA Sullivan in Cincinnati. That company no longer exists but many former employees were in Wilmington for this conference. It was great catching up with these folks after all these years. I enjoy attending technical conferences and I try to make it to as many as I can. I like talking to and learning from bright people in the developer community and picking up the latest technologies. Developer conferences are a great way to get this information and there is no shortage of such conferences. The Kalamazoo X conference is different. Although the target audience is software developers, the content will focus on soft skills. Topics such as Leadership and Social Network dominate the agenda. The conference features four tracks: Soft Skills; Architecture, Design and Process; User Experience; and Career Development. However each session will be short enough that an attendee will be able to see 100% of the content. I'll be there to share ideas on effective communication with your customer or manager, a topic I've given a lot of thought to in recent years. 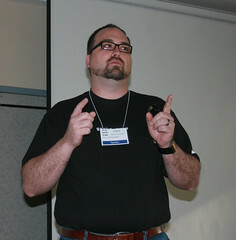 Tomorrow (Saturday April 18), I will be speaking at the Central Ohio Day of .Net in Wilmington, OH. My topic is Using Microsoft Distributed Cache to speed your application. This is similar to a talk I gave last summer at three user groups in Ohio and Michigan. However, the topic is more relevant now as the release of Microsoft Velocity nears. I have updated and expanded my presentation and written all new demos for this talk. A consistent caching strategy becomes critical as enterprise applications grow in size. With Velocity, Microsoft finally has a product in the enterprise caching space. You can get more information and register by clicking the badge below. I hope to see you there. The dust has settled and the first West Michigan .Net University is now history. You can view photos of it here. I was fortunate that my talk (Intro to SQL Server Data Models and T-SQL) was in the morning because I had tickets to the Final Four in the evening on the other side of the state. I turned out that I didn't use any of this material. We had a small group in our session so we let them set the agenda. Everyone already had at least a year of database experience so I scrapped the introductory stuff. I spent far more time than I expected showing off the features of the SQL Management Studio. We answered questions about the strategies for normalization, backing up data, and primary keys. In fact, I showed almost none of the slides we prepared. The good news is that the audience seemed happy with the session. The got their questions answered without wasting time on things they already knew. In the end, I think they were glad we were so flexible and so was I. The feedback I heard on the other sessions was also positive. Congratulations to Chris Woodruff for organizing a successful event. Overall it was a very good day. Oh... and the Final Four? Well, my Spartans won of course. It was a great day!